So what do you do when you’ve seen Luxembourg City in one day? Make a plan to use the country’s fab public transport system and get out and about! We throw open our apartment blinds – to drizzle and grey skies. This is not how we imagined a summer break in a landlocked country in central Europe. Still, we gamely throw on a couple of layers and make the ten minute walk from our apartment to Gare de Luxembourg. Getting around in Luxembourg: The public transport system in Luxembourg is efficient and cheap. An all-day combination ticket valid on buses and trains costs just 4,00€ meaning it’s simple to hop on and hop off. Tickets can be brought from bus drivers, or ticket machines at many bus stops and at the train station. There is a reduced service on a Sunday, so make sure you plan your journey and any connecting journeys carefully. Getting from Luxembourg City to Vianden: First task. Purchase a ticket. This should be done from the CFL machines or from the man in the CFL kiosk. Do not try to use any other type of machine. We almost used an international train company machine for the short journey to Ettelbruck which would have set us back 50,00€ rather than the CFL ticket total of 8,00€. Travel fail. The train from Luxembourg to Ettelbruck runs every 30 minutes and takes around half an hour. We didn’t spend any time in the town itself, but because of it’s central location and transport hub it’s probably a good base for exploring Luxembourg. From Ettelbruck station, the 570 bus stop is on the right of the station, and this half-hourly bus takes about 25 minutes to reach Vianden. We disembarked at Vianden Gare, but could have got off a stop later right in the centre of the village. Vianden: This is something of a tourist hotspot, a pretty village, with the Our River running through it, surrounded by hiking trails with a pretty spectacular castle looking down over the surrounding valley. Interesting Fact No 1: Victor Hugo spent time here during his political exile from France. Interesting Fact No 2: this was the last place in Luxembourg to be liberated in World War II. We stop for a quick drink in Café Dupont which gives us a chance to dry off from the incessant drizzle that has left us feeling a bit soggy and damp. And then we go off, back into the drizzle, to find the chairlift which will take us to the castle on the hill. We take the chairlift one way only (3,90 €) although the better views are probably on the way down rather than up. There’s not much to do once you get to the top, although there is a cafe up there, so we start making our way down the kilometre to the castle. It’s a bit slippy underfoot with all the rain this morning, but I’m still happy we’re going down and not climbing up. We get to the castle but decide not to visit. After all that effort, it now seems a shame that we didn’t. But our tummies are rumbling so we continue down the steep cobbled streets towards the village. We end up at Ancien Cinema for lunch, a quirky coffee shop-cafe-cinema, with a classic James Bond martini quote on the wall, film quizzes as placemats and Tom & Jerry playing on loop on the huge screen out back. Vianden is a pretty town, and definitely worth a visit – we were very unlucky with the weather and we would have stayed much longer had we been able to pleasantly stroll along the riverside or follow one of the trails at the top of Montée du Château. And the castle’s no Neuschwanstein but it’s still an impressive sight. It’s a little less drizzly on our last morning, but there’s still nothing positive to say about the weather. We pack up our suitcases, clean up the apartment and check out at 11am as promised. Our flight is not for another 10 hours. We already know we’ve exhausted Luxembourg City’s options so it’s back to the station (via left luggage this time; more on this later…) for another trip out. Getting from Luxembourg City to Esch-sur-Sûre: De-ja-vu. Purchase ticket (from CFL machine not international machine – we are now ticket machine experts). Train to Ettelbruck. This time we take a left at the train station to the bus stop for the 535 Bus. Buses run on this route every two hours on a Sunday so we’re careful to plan our travel times beforehand. It takes about half an hour to reach Esch-sur-Sûre. (Our bus driver appears to be playing Clean Bandit’s “Symphony” on loop, which is a new low for our Luxembourg experience.) If you’re not sure which stop to get off, my theory is always to get off the last one, as you know how far you have to walk back. In this case, it’s a 2km walk back to town from the Esch-sur-Sûre dam. Luckily it’s downhill. Travel Fail No 2. Esch-sur-Sûre. Another cute little fairytale town with a castle, although this one is in ruins (the castle, not the town). The original 8m tall tower still stands on a giant cliffside, and the town is almost completely encircled by the winding Sûre River. There’s a big bike theme going on, and it doesn’t take us long to realise that the Tour de France is travelling through this very town tomorrow. Yes, tomorrow it will be a hive of activity with the world’s best cyclists whizzing through, but today, there’s a handful of tourists, a handful of locals and not much else. It’s a good job we took that 2km walk from the dam along the riverside to kill some time. We walk around the village in 10 minutes, and it’s still 90 minutes til our two-hourly bus is due. It’s threatening to rain – and we’ve left our coats in the left luggage back in Luxembourg City – so we seek shelter and victuals in Café des Rochers Sàrl. So we wait 20 minutes, and as expected, the bus and it’s jobsworth driver arrive back in Esch-sur-Sûre. I’m tempted to ask if he’s going to Insenborn but think better of it. The driver plays Clean Bandit’s “Symphony” on loop all the way back to Ettelbruck as punishment for our insolence. We have an hour or so to kill back in Luxembourg City. The temperature has dropped considerably and leaden sky is threatening rain at any moment. We meet our second jobsworth of the day in the left luggage office. We emerge back into cold grey drizzly Luxembourg sans manteau. I fake shiver violently outside the left luggage office hoping Monsieur Jobsworth is watching and takes pity. He doesn’t. After a brief walk, we return to pick up our manteau and valise. I tell Mr Fletche I am going to open my suitcase on the floor of the left luggage office and put on all my warm clothes there and then. I also tell Mr Fletche that I am going to ask Monsieur Jobsworth his name because I’d like to feature him in a blog I’m writing about the customer service in Luxembourg. I don’t do either of these things but I am very happy to be reunited with my coat. There’s no doubt that Luxembourg City is a lovely place to visit, but three nights is too long unless you’re planning on getting out and about. We found it surprisingly pricey, almost on London/Paris/Copenhagen levels. I had a lovely g&t at Urban which came in at an eye-watering 13€. Simple meals, such as burgers, were around 15-20€. We did have a lovely meal at l’Entracte on Saturday night which was reasonably priced. I can imagine it being a good city to live in as there is a vibrant nightlife scene, a cheap and efficient public transport service both in the capital and nationally, and beautiful surrounding countryside. Microsoft, Amazon, Skype and KPMG all have European HQs in Luxembourg City and there are new sparkly buildings popping up in Kirchberg, the business district of the city. We flew direct from Birmingham International with Flybe for £77 each (carry-on only). We stayed in this well located AirB&B, a brand new apartment 10 minutes walk to Luxembourg Gare Centrale and fifteen minutes walk to the Old Town. Have you been to Luxembourg? Are there any other sights we should have seen? Thank you for reading! 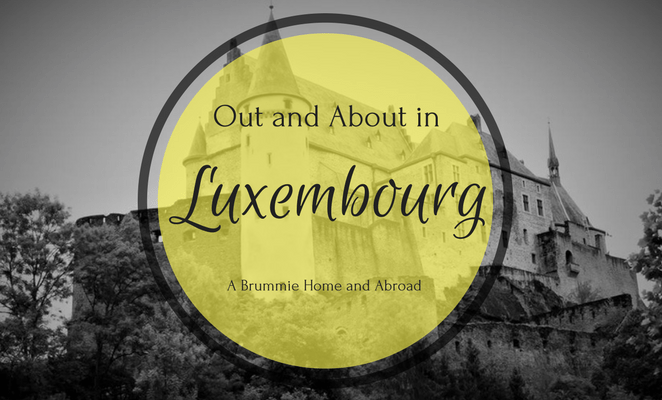 "A Brummie Home and Abroad Guide to Luxembourg City"
"15 ways to recreate that holiday experience in your own living room…"
Thanks Mel.. I’m now obsessed with Canva for pinnable images! Too bad the weather was so unpleasant to experience but the overcast days were the backdrop for some great photos. I always think the colors are more vivid when not competing with the sun and your photos are indeed lovely. Always enjoy a travel post. Good to know about local transit as I think sometimes people are afraid to use it. Loved the pictures and your descriptions. You have convinced me that I need to go for a visit. Yes, I too love your pin photo. Enjoyable post, Em.